New Listing on the Manitowish Waters Chain of Lakes! Great for Fishing and Year Round FUN! 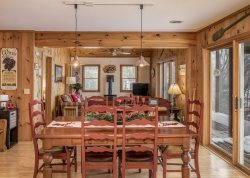 Relax and unwind in this well appointed home on the Manitowish Waters Chain of Lakes! Nestled lake front on a quiet bay with sandy shoreline, perfect for swimming. Spend your summer days reeling them in at this perfect fisherman's spot or venture out for a day on the chain with close access to Rest Lake to the west and your choice of Clear Lake and Spider Lake to the east! Gather around the firepit with family and friends creating lasting memories under the Northwoods starry sky. Watch for eagles and listen for loons as you fully enjoy all that Keepin' it Reel has to offer. Spacious and beautiful, Keepin' it Reel has everything you need for your Northwoods getaway! Modern amenities with a fresh, updated look, comfort is exactly what you will find at your own private oasis. Perfectly situated close to town, the possibilites are endless for eating out, seeking adventures, or simply taking in the ever abundant nature. Traditions start here at Keepin' it Reel! It's not just a vacation, it's a lasting memory.